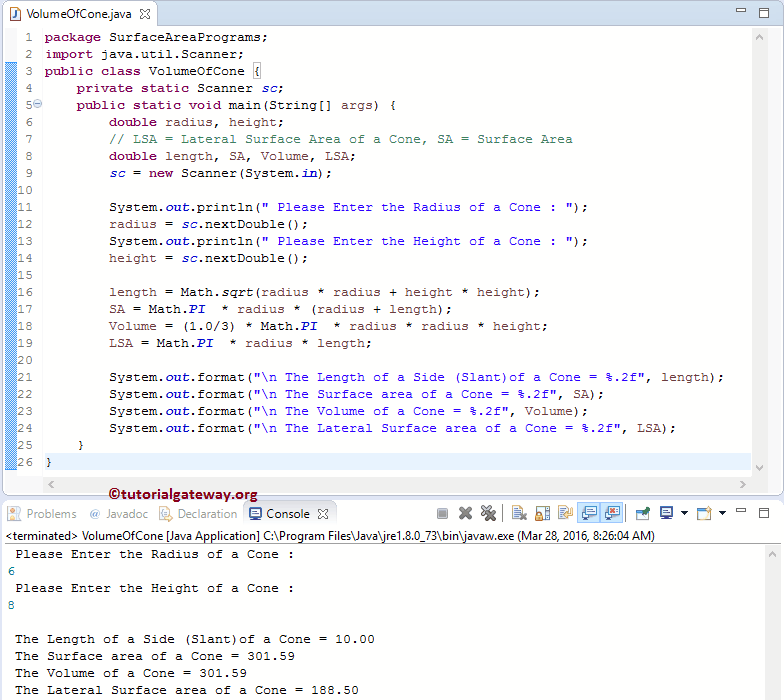 This Java program allows user to enter the value of a radius and height of a Cone. Using these values it will calculate the Surface Area, Volume, length of a side (Slant) and Lateral Surface Area of a Cone as per the formulas. Following statement will allow the User to enter the radius and height of a cone and then we are assigning the user entered values to already declared variable called radius and height. This Java program allows user to enter the value of a radius and height of a Cone. Using these values it will calculate the Surface Area, Volume, length of a side (Slant) and Lateral Surface Area of a Cone as per the formulas. In this example, we are going to use the logic that we specified in first example but we will separated the logic and place it in a method. Next, we are calling the LengthofCone method by passing two arguments. This is the first method that we created with double data type and this method will calculate Length of a side and return a value so, we are assigning the return value to length variable. Next, we are calling the VolumeofCone method by passing two arguments. This is the second method that we created with double data type and this method will calculate Volume of a Cone and return a value so, we are assigning the return value to volume variable. Next, we are calling the SurfaceAreaofCone method. This is the third method that we created with double data type and this method will calculate Surface Area of a Cone and return a value so, we are assigning the return value to SA variable. Next, we are calling the LateralSurfaceAreaofCone method. This is the fourth method that we created with double data type and this method will calculate Lateral Surface Area of a Cone and return a value so, we are assigning the return value to LSA variable.